(Wailuku, Maui) It’s the only Natural Area Reserve in Hawai‘i where the ocean and water activities are the primary draw for visitors and residents. The Ahihi-Kina’u Natural Area Reserve has one mile of open coastline and attracts hundreds of people every day to surf, snorkel, or simply to enjoy the clear waters of the Reserve. It’s part of a vast ocean playground on Maui’s south shore, with the corridor managed and maintained by a variety of county and state agencies. This means there are different rules and guidelines for each locale. Fishing might be allowed in one place but not another. One area may be closed, another is open. Dogs are allowed here, but not there. With an estimated 1,200 people driving south of Kihei, Wailea and Makena and passing into or through Ahihi-Kina’u on a daily basis the Reserve’s Outreach and Volunteer Coordinator latched onto the idea of creating a map of Maui’s south shore to guide visitors and the folks in the visitor industry who serve them. Jeff Bagshaw gets and answers questions on a daily basis, not only about Ahihi-Kina’u, but covering a wide range of topics and issues. He tries to correct mis-information and inaccuracies, which is plentiful in blogs, in travel guides, by word-of-mouth, and on social media sites. This week, 30,000 copies of the activity map for the Makai side of moku Honua ‘ula (the moku or land division stretching from Hoapilli Trail in the east to Polo Beach Park to the west) were printed and distribution is beginning to visitors, local residents, hotel activity desks, surf and dive shops, etc. Bagshaw said, “Our goal is to reach people, through area businesses, before they reach Ahihi- Kina‘u. This is a way for reliable information about activities, resources, amenities, and caring for the Reserve and surrounding areas to get into the hands of users. 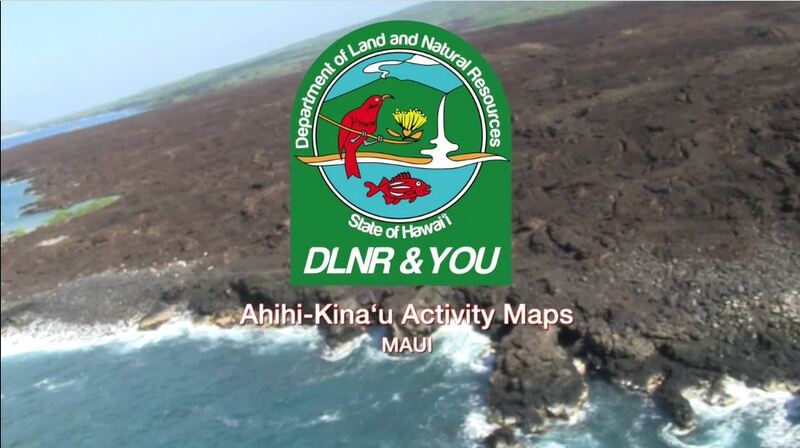 With all the agencies that have jurisdiction over the lands and waters of this moku contributing to this map, we hope it becomes the source for accurate messages for visitors and those in the travel and visitor industry who interact daily with guests.” Maui County Parks, the DLNR Divisions of State Parks and Historic Preservation, and the National Atmospheric and Oceanic Administration, along with numerous area residents provided information and reviewed the map. A grant from the Hawai‘i Tourism Authority supported its first printing. One side of the map depicts natural and cultural features of the area, and the flip-side shows the open portions of the Reserve. Both sides are loaded with tips and valuable information for residents and visitors alike. Area businesses can get laminated copies for employee training and reference and anyone can get a paper copy of the map when they visit the reserve. Eventually the map is expected to be translated into Japanese, Korean, and Chinese.